Well, almost everything! This is the binder where you will put the things you can’t bear to part with; like that driver’s permit she no longer needs because she passed the test and has the real deal now or those ASB cards from years past. It is also a fantastic place for your teenagers to keep their own passwords! You know those little pieces of scrap paper aren’t doing the job and they end up getting frustrated and starting new accounts everywhere. Is that just us? But that’s not all! 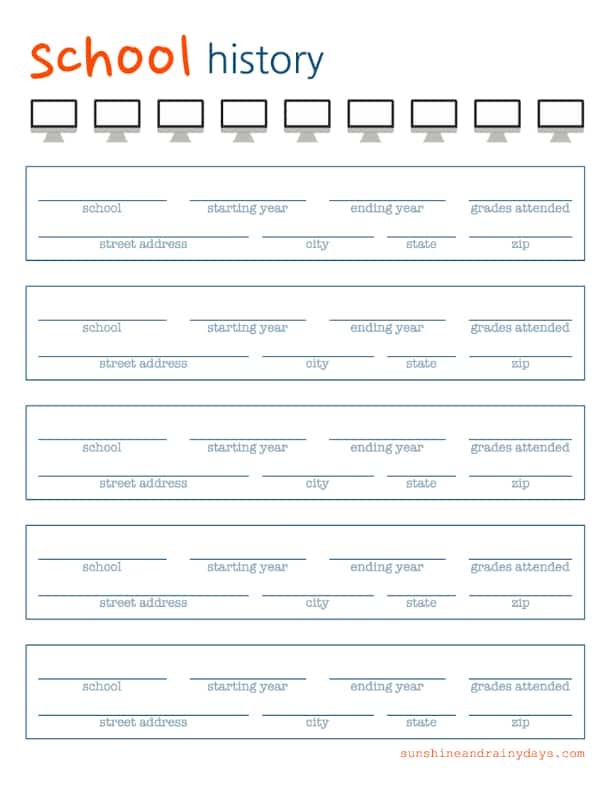 Employment, School, and Vehicle printables will help teenagers organize pertinent information. The Big Book of Everything for Teens empowers your teenagers with the information they need at their fingertips! 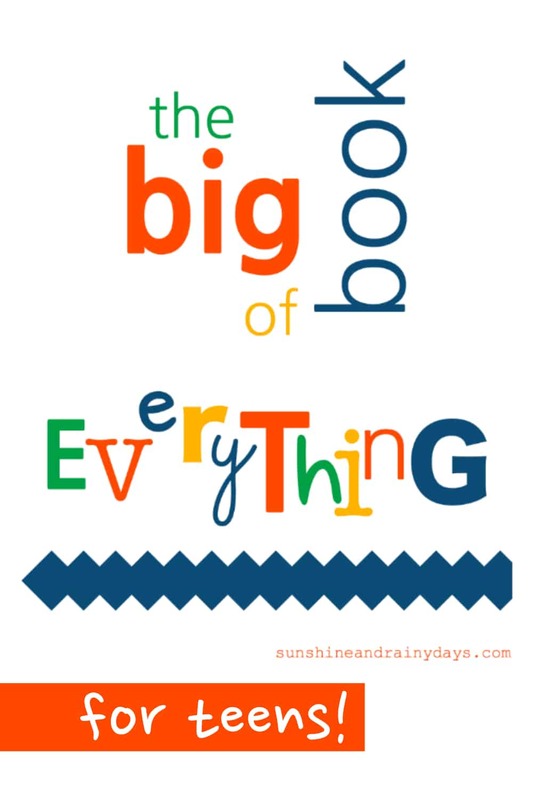 I Want The Big Book Of Everything For Teens Now! Our kids need a system for passwords just as much as we do! What better place to keep those Minecraft passwords than their very own B.O.E. (Big Book of Everything)? It is so fun to look back at previous years’ Dream Sheets! We try not to call them resolutions around here! 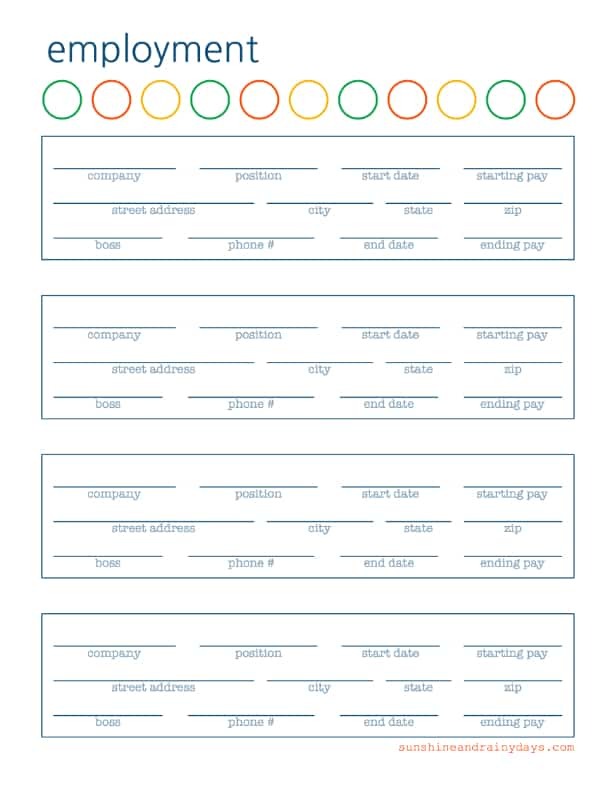 Help your teenagers keep track of their employment with our employment printable! Next time they fill out an application, they’ll have the information they need! Do your teenagers have bank accounts? This is an excellent place to keep their banking information! Do your kids have savings bonds? Have they bought gold or silver? The Big Book of Everything is an excellent place to keep the paperwork! Make life easy and write down school information. When you need it, you need it! You may also choose to put report cards in this section! When it’s time for driving and insurance, you may want to have it handy in case a better rate is given for smarty pants drivers! 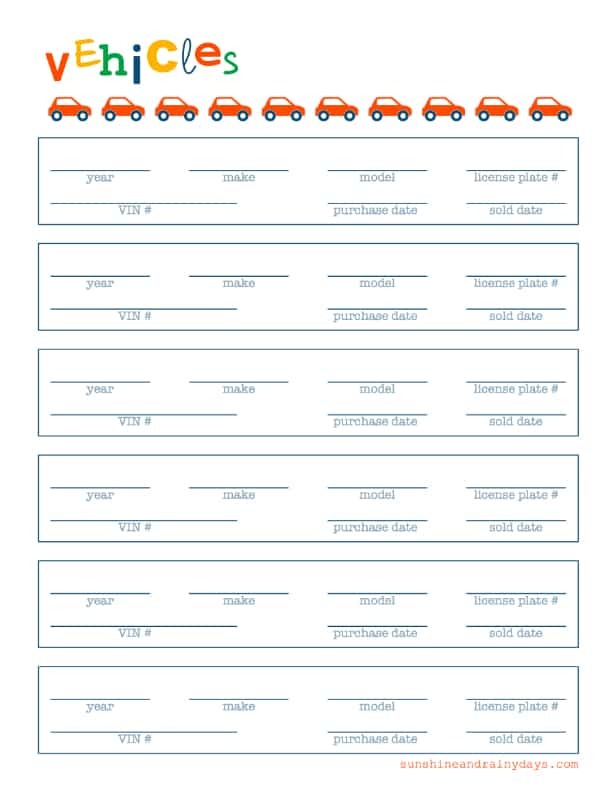 Vehicles Printable – No more digging through files looking for the VIN # or the year of your car! Nope! YOU are organized and have it all recorded right here in the B.O.E.! Driver’s Contract – Because it’s good to make expectations clear! Titles – This is an excellent place to put your vehicle titles! ASB Cards – It’s so fun to look back at these! Like the year my son was captured with his eyeballs rolled back. Yep! That’s a keeper! Permits – This is the stuff memories are made of! Passports – You’ll always know where to find it if it’s in the Big Book of Everything! Social Security Card – When it’s time for that first job, they will know right where to go! Birth Certificate – Oh, man! How many times do we have to pull that out for sports? Stick it in The Big Book of Everything and make it easy peasy! We recommend keeping The Big Book Of Everything in a safe! This post contains affiliate links! If you purchase through an affiliate link, we receive a small commission but your price remains the same! See our full disclosure. We each have a different color for easy identification! These are my favorite dividers because they have pockets! Who doesn’t like pockets? The tabs do stick out beyond the edges of the binders but they also stick out far enough so you can see them beyond sheet protectors! Sheet protectors are excellent for those things that you don’t want to hole punch. Like birth certificates! It’s always good to have cardstock on hand! It is also much easier to slide into the view binder covers and spine! I’m actually so excited about my teenagers’ Big Books Of Everything that I want to make one for myself too! You can even take it a step further with Erik Dewey’s Big Book of Everything! It is very comprehensive and absolutely free! This is fantastic! I teach at risk young adults, many of whom are already parents, so this would be amazingly helpful! Great post! Thank you, Erica! It really helps to organize all that paperwork!